Four centuries ago Giovanni Paolo Maggini (b. 1580 in Botticino Sera, near Brescia) was in the prime of his working life. At age 21 he was first recorded in Brescia as an apprentice of Gasparo Bertolotti “da Salò”, though his training must have begun at an earlier date. In 1604, Maggini was perhaps past the age of a simple “student” but was still associated with his master’s workshop. Three years later Maggini purchased his own home and workshop; he was still relatively young when his master Gasparo died in April 1609. His demise in 1630–31, at about 50, marked a sudden arrest of the Brescian art and craft of stringed instrument making that had evolved to a very high degree in the previous century. Maggini’s formative years and subsequent artistic development occurred on the cusp of the late Renaissance and early Baroque periods. At this stage in history there were no uniform standards or ideals that governed bowed instrument construction, shapes, measurements or tunings. Consequently, much of Maggini’s energy was focused on designing and crafting instruments to match a function or role. In the search for greater expressive means and acoustical efficiency, he devised many solutions that left a lasting impression upon later luthiers. In a career that spanned less than three decades, Maggini left an extraordinary body of work consisting of a large and varied group of bowed instruments. To a much greater extent than the surviving output of his contemporary Girolamo Amati (d. 1630), Maggini’s existing oeuvre gives us insights into the imagination of a brilliant master who freely experimented with subtle variations in form and design. He built violins ranging in body length from 34 to 37 cm, and violas of a smaller alto and larger tenor form. The bass-register instruments were generally called “violon” or “violone”, meaning “large viola”, occasionally with the additional term “da gamba”, though such terminology was not applied consistently. In simple terms, whether large or small, they were played with one or both of the player’s legs in contact with the instrument while in a seated or standing position. In total, about a dozen of Maggini’s bass-register instruments (either in complete or partial form) now survive and with rare exceptions they are now fitted as four string cellos or double basses. The “Delmas” double bass can best be understood and appreciated in the context of the maker’s many endeavors to improve and refine the design and construction of bass and contrabass instruments. To judge from his surviving works, Maggini devoted particular care and attention to bass and contrabass instruments of three distinct types. Before describing each type, some general observations may be made about the entire group. They were strung with either five or six strings and were mounted with fingerboards that were far shorter than those in use today. The necks were wrapped with gut frets at the first seven semitones. The ranges and tunings of these instruments are subject to some debate though the compass was narrow by modern standards. 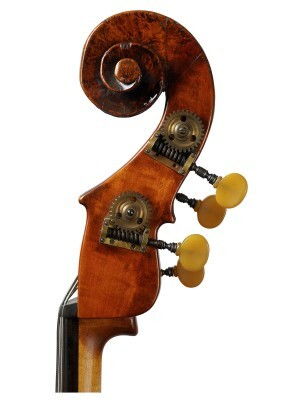 And as difficult as it may be to imagine today, technological improvements in the winding of gut strings probably influenced the design and size of bass instruments as players and makers sought greater power and clarity. 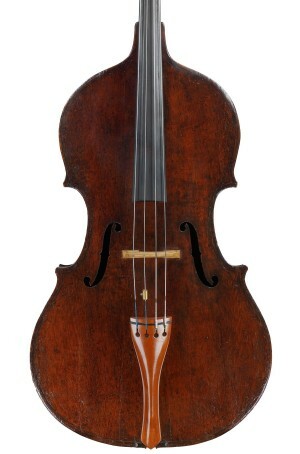 Maggini’s small arched back violones, of 75 cm or slightly longer in back length, are typically now configured and used as violoncellos, though in all likelihood they were originally built with more than four strings. It should be remembered, too, that the term “violoncello” or “violoncino” did not enter the written Italian vernacular until a generation or more after Maggini’s death. Maggini’s medium and large model violones were built with flat backs and slightly sloping shoulders, though in Brescia neither of these two design features were exclusively employed in bass-register instrument construction. The medium sized version, with a body length of slightly under 100 cm, is sometimes referred to as a “bassetto” (small bass), something of a misnomer. Maggini’s largest basses, with body lengths of about 108 cm, include the “ex Dragonetti” plus the two other examples that were exhibited in Brescia in 2007. The medium sized model seems to have coexisted with its larger brother, although determining a precise chronological sequence for Maggini’s work is hazardous because he never dated his labels. 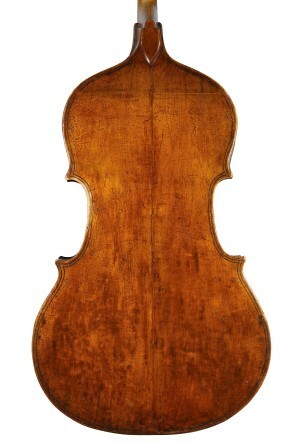 There were ample historical precedents for both the medium and large models: in the general dimensions of body outline, Maggini’s medium model is not dissimilar to a violone made by Ventura Linarol in Padua in 1585 (in the Kunsthistorisches Museum, Vienna), although Ventura did not employ “violin corners”. Maggini’s teacher Gaspar da Salò, and at least one other earlier Brescian master, built basses of slightly greater size than Maggini’s own large model. For the body design of both his medium and large models, Maggini adopted a proportional ratio of 5:3 between body length and lower bout width, though the larger model has a relatively greater upper bout width. Numerous other details confirm the close relationship in overall conception of the two models. The rib heights vary by 2–3 cm, which means that the interior volumes of the bodies were appropriate for clearly producing contrabass tones. The original heads vary in height by only about 2 cm. The large and medium models have other significant traits in common: the bridge is positioned near or at the geometric center of the table. The diameters of the upper and lower eyes of the soundholes are nearly identical, as are the widths of the soundhole throats at the nicks. These details are remarkable considering the great difference in soundhole length between the two models: about 22.5 cm for the large model (like the “ex Dragonetti”) and 17.5 cm for the medium (such as the “Delmas”). I am unable to explain Maggini’s design decisions, though he was evidently convinced of the soundness of his judgment because he adhered to these basic plans on more than one occasion. The “Delmas” is the most complete and pure example of Maggini’s medium-sized basses. However, the best known example of the medium-sized Maggini bass is the “Dumas”, now privately owned in Japan, which was the only bass instrument cited in Margaret Huggins’s celebrated monograph on Maggini that W.E. Hill and Sons published in 1892. The “Dumas” was also illustrated in both David H. Stanton’s The String (Double) Bass (1965) and the Brescia 2007 Exhibition catalogue. The Museo Civico in Brescia owns another medium-sized example, though the table and head are replacements. The remains of a third specimen, built on a cornerless “guitar” form, are now in the reserve collection of the National Music Museum in Vermillion, SD, USA (no. 3431). The bodies of the “Dumas” and “Delmas” are made upon a virtually identical form, the most apparent difference occurring in the shape and size of the corners. However, the “Delmas” is more carefully finished and the curves leading in and out of the C-bouts are more gracefully treated. The “Dumas” table is made of a ruggedly figured spruce that was prized by both Maggini and his master Gasparo for its superior tone qualities. By contrast, luxurious materials – a dense, masculine spruce for the front and a delicately figured maple for the back and ribs – distinguish the “Delmas” and bring to mind the similar materials used in two of his large model basses: the “Dragonetti” and another in a private American collection. Very few of Maggini’s bass instruments still have their original heads and the “Delmas” is exceptional in being the only example of the medium size with an original head. Whether or not the design was an adaptation of an earlier prototype by one of his Brescian precursors is not clear, but Maggini’s head features a rounded heel, outward projecting points near the center of the pegbox profile, and a strongly articulated scroll. He slightly varied the treatment of the front and rear profiles: the “Delmas” head is double fluted around the scroll but the fluting terminates at the center of the pegbox, below which it finished flat. Much the same handling can be seen in the large model bass now in a private American collection. Maggini’s head designs were profoundly influential and not only among makers in the Veneto region. Nineteenth-century makers in Italy working as far afield as Leopold Noiriel in Turin and Giuseppe Baldantoni in Ancona were inspired by Maggini’s heads. Multiple subsequent variants entered the vocabulary of double bass makers in Austria, Germany, Hungary and elsewhere in Eastern Europe. The “Delmas” is a superb example of Maggini’s mature artistry and its survival over four centuries is a tribute to both its durability and the high esteem in which it has been held. The ‘Delmas’ Maggini double bass is named after Alphonse-Joseph Delmas ‘dit Boussagol’ (1891–1958), one of the foremost French double bassists and pedagogues of the 20th century. He was a pupil of Eduard Nanny at the Conservatoire National in Paris from 1909 until he matriculated with a First Prize in 1911. For his extensive service in the French Army during the First World War, Delmas was awarded numerous citations and medals. Upon returning to civilian life, he performed with the orchestras of the Concerts Pasdeloup and Concerts Colonne in Paris. Delmas joined the New York Symphony for the 1923–24 season, during which time he also performed solo concerts in the New York City area, including at the Waldorf Astoria Hotel. In the 21 January 1924 issue of the Sun and the Globe Delmas’s photograph is captioned ‘America’s only double bass soloist’, reflecting the fact that recitals by double bassists were then a relative rarity in America. After returning to Paris, Delmas became the soloist of the Concerts Lamoreaux and the French National Radio Orchestra, among many other ensembles. He succeeded Nanny as professor at the Conservatoire National in 1939 and in the same year was named Chevalier of the Legion of Honor. His prolific concert activity included collaborations with numerous chamber musicians, including the Calvet, Kolisch and Pro Arte Quartets and the Pasquier Trio. Under the composer’s direction, he also made early recordings of Igor Stravinsky’s Histoire du Soldat and the solo of the Pulcinella Suite. 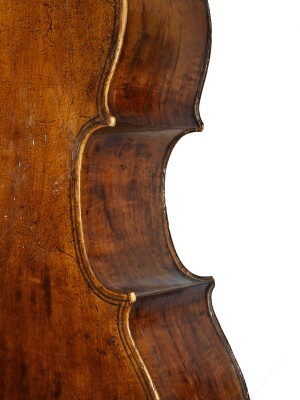 It is not known when Joseph Delmas acquired the Maggini and there are few clues to the instrument’s provenance before the mid-20th century, when it was repaired at Versailles by the distinguished luthier Marcel Deloget, who was often called upon to restore fine basses in France during the middle of the 20th century. 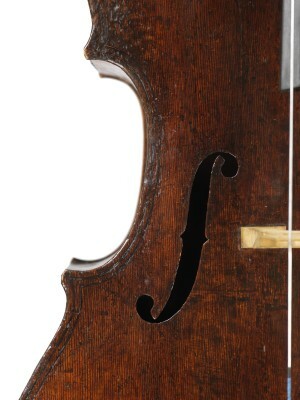 The instrument’s excellent state of preservation leaves the clear impression that it was unusually well protected for a very long period of time, as many of the frequently encountered signs of exposure (for example, woodworm infestation) and player stress are minimal, especially for a large instrument of this age. The bass also bears a manuscript repair label of Andreas Miller of Innsbruck, Austria, dated 1836. Perhaps future research will reveal if during the first two centuries of the instrument’s existence it resided in one or another locality in western Austria.